By Michael Eggleston* (Advanced Biofuels USA) Flying in Formation: Since the first test flight almost 10 years ago, there have been over 40,000 commercial flights supported by four international airports supplying SAFs. Michael Gill, Executive Director of the cross-industry Air Transport Action Group (ATAG) says that analysis has shown that up to 100% of the fuel in 2050 could be from sustainable sources with the right policy measures in place. He comments that it is vital that governments and industry stakeholders alike show their support behind these new sources of fuel for aviation as it will be a key component of the industry’s climate action plan. Earlier this month, over 300 delegates met in Geneva for the Ninth Global Sustainable Aviation Summit, organized by ATAG to discuss such plans. The Summit brought together sustainability experts from industry and governments alike to review the role air transport plays in supporting today’s economic growth while mitigating the risk of environmental impact. This year’s summit re-visited some vital areas of action around climate change, whilst exploring new areas of focus such as implementing the UN’s sustainable development goals (SDGs) as a business framework. Recently, the second Conference on Aviation and Alternative Fuels took place in Mexico City, where the International Civil Aviation Organization’s (ICAO) vision was further discussed with delegates from the industry. Despite biofuels’ mitigating climate change, the ICAO has a more urgent challenge to deal with as nearly 100 environmental and poverty groups released a letter that week slamming the proposal due to the fear that palm oil expansion for the purpose of bio-jetfuel production would further drive deforestation. Global aviation generates approximately 2 percent of global GHG emissions and is forecast to grow to 5 percent by 2050. While most industries have a range of cost-effective options available to reduce carbon emissions, aviation does not. For the foreseeable future, there is no alternative to liquid fuels for jet aircraft. 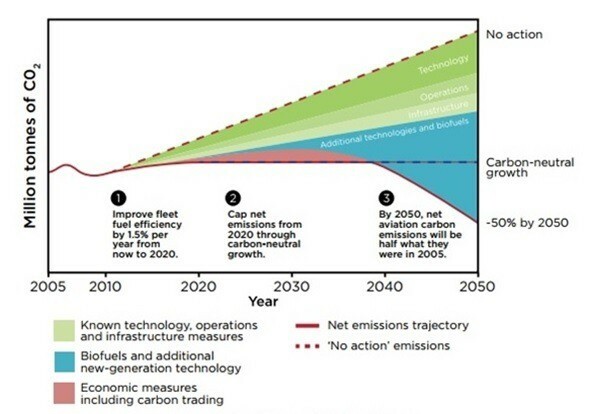 The single largest opportunity to decarbonize air travel is to replace conventional, fossil-based jetfuel with sustainable aviation fuel (SAF) also commonly referred to as bio-jet or bio-kerosene. SAF’s are almost chemically identical to traditional jetfuel, but are synthesized from other, more sustainable ‘feedstocks’. These feedstocks can take the form of plant matter, municipal waste or even used cooking oil. To qualify as truly ‘sustainable’ alternative fuels, the feedstock must fulfill certain criteria, meaning, in part, that the feedstock used should not compete with food crops or other agriculturally sensitive produce. This is why many recent innovative alternative fuels have been produced using sources such as waste, microalgae, or saltwater tolerant plants that grow where the food crops cannot. However, the emissions-reduction potential of different feedstocks may differ significantly with values ranging from 50 to 90 percent of the claimed potential reduction when compared with fossil jetfuel. The vast majority of SAF available now is derived from oleochemical feedstocks such as vegetable oil, animal fats, and used cooking oil (UCO). However, costs for these feedstocks, as well as supply and sustainability concerns, make it impossible to quickly scale up production in order to meet demand in the near-term. 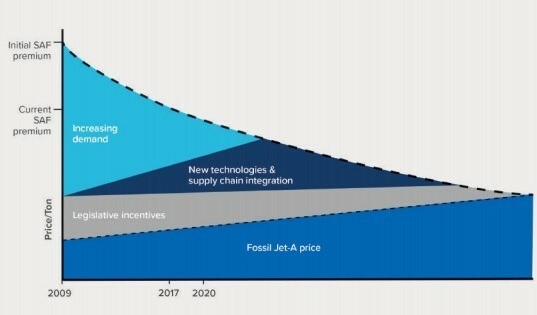 The oleochemicals-to-bio-jetfuel pathway will not supply all future needs, but is currently the foundation technology used to establish initial supply chains. According to the Rocky Mountain Institute’s (RMI) report, Innovative Funding for Sustainable Aviation Fuel at U.S. Airports, advanced technologies have the potential to meet long-term goals, but are at least five to 10 years away from commercial maturity. These technologies use other feedstocks, such as forest or agricultural matter or other lignocellulosic biomass, waste streams, and algae. Pathway Feedstock Blending Aromatics Content Technology Developer ASTM Cert. Achieving the GHG emissions reduction targets proposed by the aviation industry and by the ICAO will require a significant increase in SAF production and consumption. RMI notes the exact volumes required to achieve specific goals are not clear because of factors such as the aviation sector’s future fuel consumption, the extent of emissions reductions achieved through offsets, and the specific emissions-reduction potential of various options for making bio-jetfuels, which were mentioned in Table 1. Drop-in fuel compliance; Aircraft and airport fuel storage and delivery systems are designed to last for decades; new fuels must be compatible with existing systems. Chemical flexibility – cannot freeze, boil, or absorb water; A plane may take off from a scorching Arizona desert, climb to a freezing 30,000 feet, and land in a humid Louisiana swamp. Raw material competition; SAF producers will need to compete with biodiesel and ethanol producers and SAF purchasers must pay a sufficiently high price to keep SAFs from being sold into distillate fuel markets. Tax incentive acquisition; Many of the tax and other incentive programs for blending of biofuels into highway fuels have traditionally not been available for SAFs. Discussing these challenges at the conference was a panel lead by Julie Felgar, the Senior Advisor at CollaborateUp; a conversation from which much can be learned as commercialization of SAFs lags behind about a decade from biofuels that have been taken up by the automotive industry. High SAF prices are the primary reason for the slow uptake and the related absence of large-scale production capacity. Despite government incentives, the price premium for SAF is still significant. Airlines operate on low profit margins with fuel as the largest expense; thus, there is limited ability to absorb these additional costs. The challenge for this industry now is to produce these fuels in a sufficient quantity at a competitive price, making them commercially viable. Due to scaling growth, the development of dedicated production capacity and increasingly efficient supply chains, the price difference between SAFs and petroleum-based aviation fuel has fallen dramatically to roughly three times the price of conventional fuel. The actual cost of SAF and its cost difference relative to fossil-based jetfuel differ significantly across regions, driven by feedstock price, conversion technology/capital investment for a production facility, the policy environment, supply chain logistics, and other factors. The Commercial Aviation Alternative Fuels Initiative (CAAFI) R&D Team has developed a series of white papers addressing these key challenges related to alternative jet fuel development. Despite these challenges, SAF technology and deployment are progressing. Alaska Airlines, KLM, and United Airlines have all deployed bio-jetfuel on commercial flights in 2011 to demonstrate how the fuels could be integrated in regular service. Furthermore, in 2012, the first airline purchase agreement for regular supply was linked with a prospective SAF producer. Then in 2014, the first volumes of SAF from a commercial SAF plant in Brazil were used in commercial service that year. Later during the conference, during a workshop held covering the theme of innovation solutions to address climate change, Shamsul Leman, Head of Occupational Safety, Health and Environment at Singapore Airlines (SIA) illustrated how their effort to reduce international aviation emissions in partnership with the Civil Aviation Authority of Singapore (CAAS) has resulted in a series of 12 ‘green package’ flights over a three-month period along a non-stop San Francisco-Singapore route. The ‘green package’ flights are the first in the world to combine the use of biofuels, fuel-efficient aircraft and optimized flight operations which provide the industry with valuable insight into the economics, logistical requirements and performance of these SAFs. The beginning of 2016 saw a landmark event to normalize the use of SAFs with Oslo Airport becoming the first international hub in the world to offer the fuel to all airlines serving the airport. This is also a particularly significant step, so far as the supply method is concerned, with the fuel being incorporated into the airport’s hydrant system, which means that airlines do not need to alter their normal re-fueling process. Original equipment manufacturers (OEMs) have been instrumental in the development of SAFs, with two leading manufacturers, Airbus and Boeing, making significant contributions. Airbus has developed programs in Australia, Brazil, Qatar, Romania and Spain, and has partnered with China’s Tsinghua University and the China Petroleum and Chemical Corporation (Sinopec) to explore bio-jet development in China. Airbus has also carried out numerous test flights using bio-jetfuels. Panel members emphasized that policy support is widely recognized as essential if SAF deployment is to be successful. The Indonesian government’s announcement of a mandate for SAF is one example of public-policy support that could have a significant impact on bio-jet development. However on a global basis there have been very limited government efforts to develop and implement the types of policies that have been successful in promoting road-transport biofuels. These include mandates, tax incentives and subsidies. This low level of government policy support is one of the main reasons why there has been limited development and deployment of SAF. The lack of direct government involvement might be partially due to the international nature of aviation and the legal role of ICAO. At the international level, the ICAO plays a major role in global development of the aviation sector. It works with 191 member states and global aviation organizations to develop international standards and recommended practices. The member states are obliged to reference those standards when developing their own legally enforceable national civil-aviation regulations. In 2016, after many years of debate and planning, the ICAO has agreed on a new global market based measure (GMBM), with the goal of implementing these measures by the end of 2020. Such market based mechanisms would provide the basis to set a price on emissions, seen as the primary means for emission reduction at the national and regional levels. GMBMs have been proposed as a way to bridge the time gap, by limiting carbon emissions while bio-jetfuels and other technologies are developed. After 2020, technological, infrastructure and operational efficiency measures will be complemented by the ICAO Carbon Offsetting and Reduction Scheme for International Aviation (CORSIA). Under CORSIA, aircraft operators will be required to purchase offsets, or ‘emission units’, for the growth in CO2 emissions covered by the scheme. CORSIA aims to address any annual increase in total CO2 emissions from international civil aviation above 2020 levels. In order to address the concerns of developing states and to take into account the special circumstances and respective capabilities of states, CORSIA will be implemented in phases. The adoption of CORSIA by governments meeting at ICAO is the first climate measure of its type for any global industry and is a solution which will help airlines avoid a complex patchwork of different schemes and achieve carbon-neutral growth in a cost effective way. The industry has already pushed to get CORSIA implemented for more than six years, but as of September 2017, only 72 member states out of 191 have volunteered to be part of its first phases. This represents close to 88 percent of international aviation activity and 80 percent of emissions growth above 2020 levels. Still, in order for CORSIA to be successful the participation of all member states is needed for it to be fully effective, said UNFCCC Deputy Executive Secretary Ovais Sarmad during the Summit’s keynote address. How will airlines commit to keeping this promise over the years to meet their climate goals? Leading the cause for intergovernmental framework to limit emissions, the EU decided to add aviation to its Emissions Trading System (ETS). In 2012, the new directive made it a legal requirement that the aviation sector joins the ETS making clear that the EU will focus its compliance activities on all flights within and flying into and out of the EU. Besides pushing for mandates, helping investors past the “valley of death” stage of commercializing the technology will be needed, as financing for these types of pioneering projects has proven difficult to obtain, particularly at a time of low oil prices. Industry and customers can also play their part in helping expand the production and use of SAFs. For example, KLM’s corporate program and the Fly Green Fund are some of the corporate programmes that encourage customers to cover the price premium of using SAF. Increased use of SAF is essential for the aviation industry to meet its carbon emissions-reduction goals. Currently the vast majority of SAF is derived from oleochemical feedstocks and uses the HEFA pathway which has a mixed reception to being carbon ‘neutral’. However, this will likely remain the main conversion route over the next five to 10 years, as methods using biomass, lignocellulosic and algal sources, and other advanced bio-jet technologies, are still maturing. Thermochemical technologies are the most likely to provide the large volumes of advanced SAF required, partly because the co-products produced by biochemical routes to bio-jet are valuable in the chemical, lubricant and cosmetic markets. Although a number of commercial facilities in operation worldwide can produce HEFA-SPK, they were primarily established to make renewable diesel. Only one facility, AltAir Fuels, is primarily dedicated to SAF production. Without specific interventions and incentives directed towards SAF production and use, current policies in jurisdictions such as the U.S. will favor the production of renewable diesel over SAF. Airports must take leadership in pioneering the adoption of SAFs avoiding competitive distortion by fueling all airlines with mandatory blend ratios and by effectively communicating their sustainable development goals to their stakeholders to inspire a chain reaction of support and to facilitate action from governments to incentivize the uptake of these fuels. * Michael Eggleston is a chemical engineering student specializing in the process control & risk management of sustainable development with the University of Rhode Island’s International Engineering Program and spending a semester abroad at the Technische Universität Darmstadt: Darmstadt, Germany. He will be reporting on and representing Advanced Biofuels USA at international conferences.